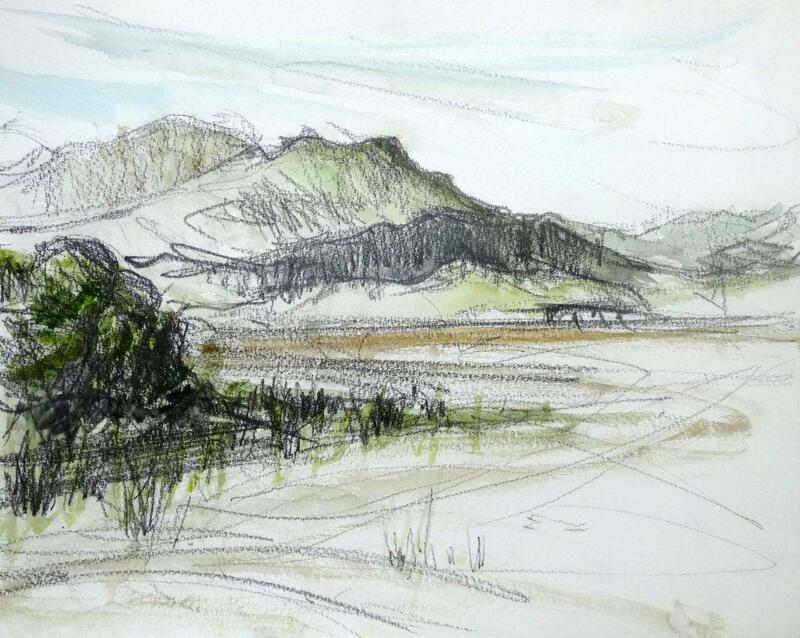 I’ve just returned from a fortnight in North Wales where I sketched and further explored my favourite area in the Rhinog mountains and the beaches around Harlech. The weather was bright for the most part, with some dramatic ‘weathery’ intervals. 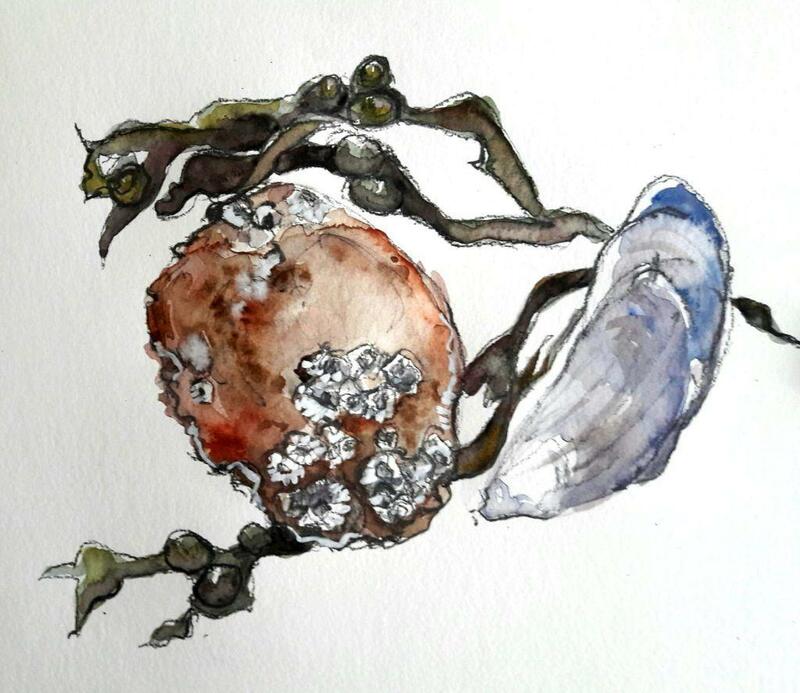 I went out sketching every day to collect information to use back in the studio and to refresh my memories of the place, its unique atmosphere and beauty. Here are the results! I am currently working on making these into a Welsh sketchbook which will be available to buy shortly. 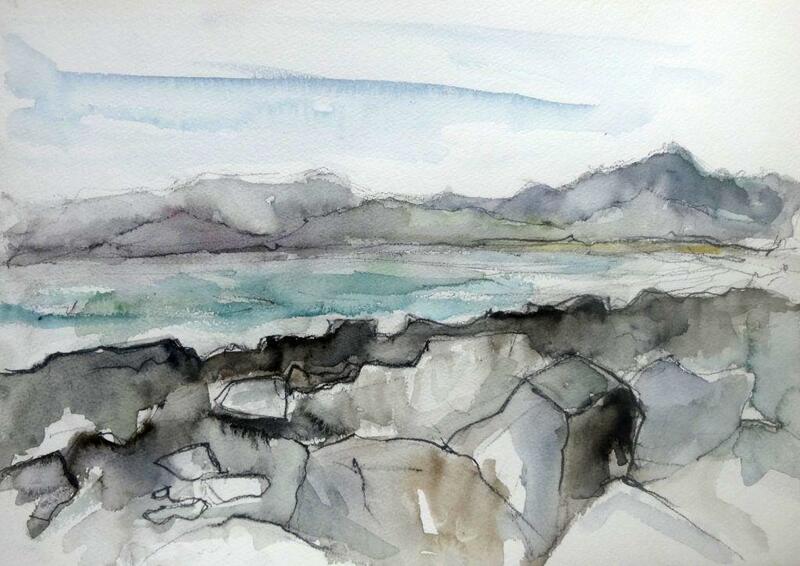 We walked out at to Ynys Gifftan at low tide, where I sketched in the sun. 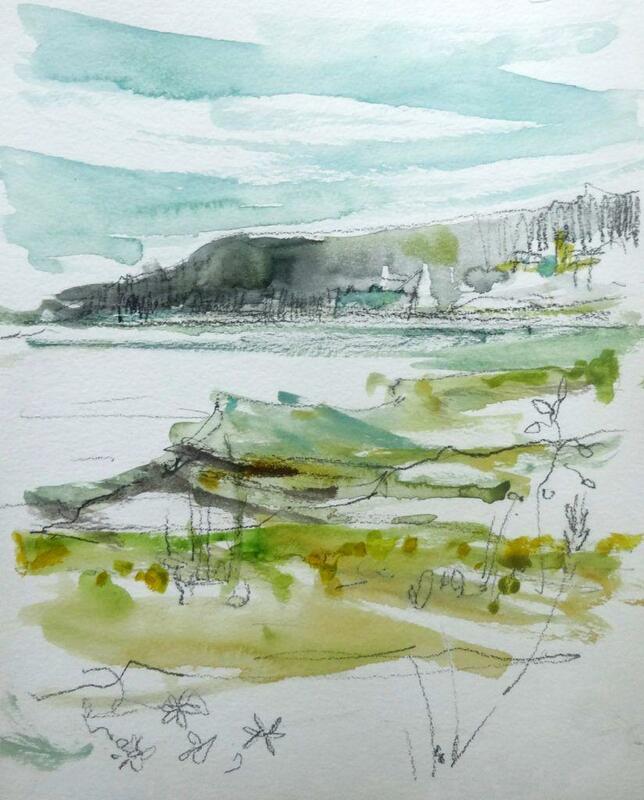 This is the view towards Portmeirion. The rocks were surprisingly blue with spots of bright ochre lichen. 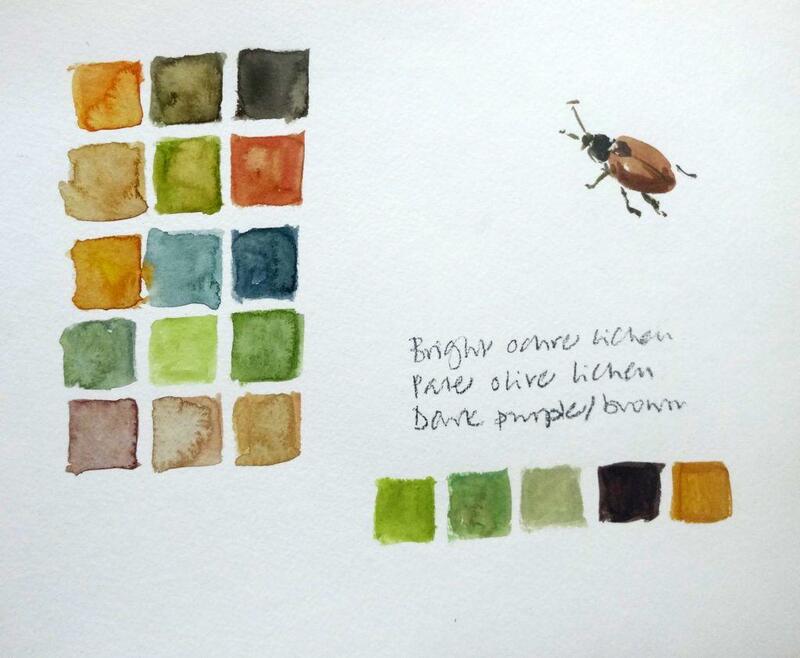 I like to record colours in little palettes for reference back in the studio. A lovely copper-coloured beetle kept landing on my paper, so he was imortalised too! On the other side of the island you can see the bridge from Talsarnau backed by steep hills. 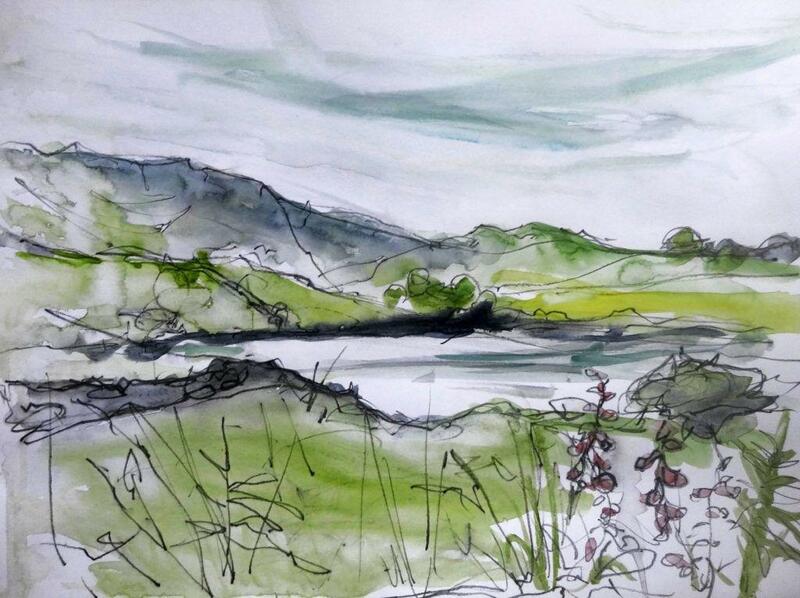 Foxgloves, rushes, bracken and thorns. 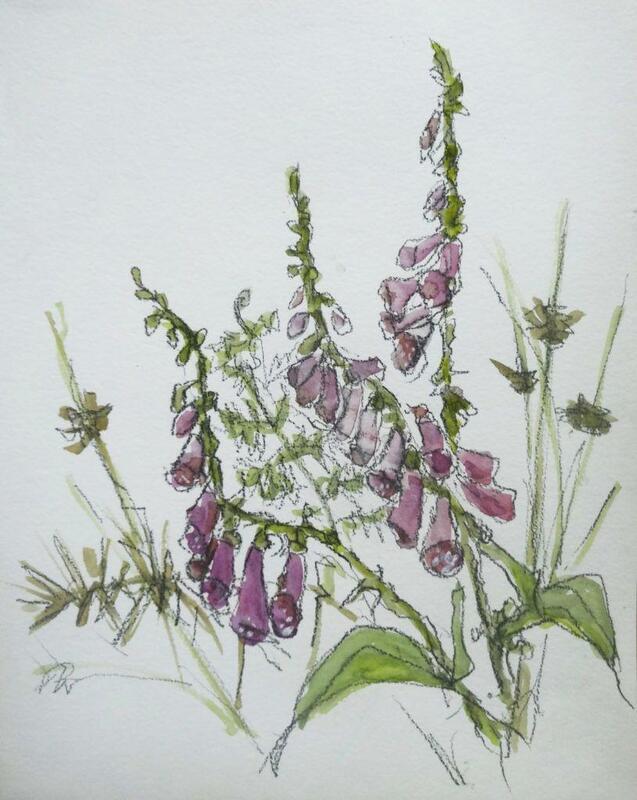 Foxgloves grow like weeds in the Rhinogydd area and turn fields and hillsides pink. 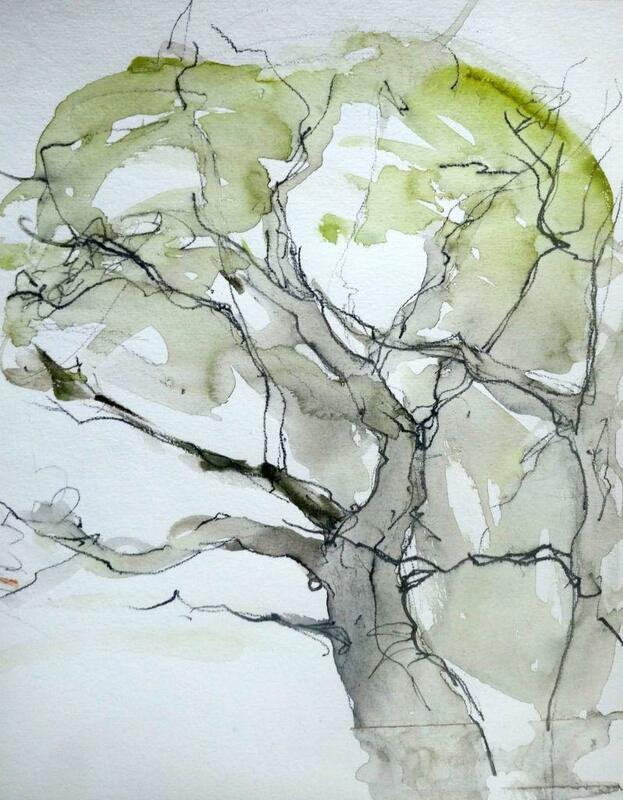 Oak tree. Just down from the house where I stay there is dense woodland, now owned and managed by the Woodland Trust. It is a rare example of a British rainforest, with deciduous trees and rocks cloaked in bright green moss. There is a lake in the land near the house – a large area with lily pads, trout, reeds and rushes. 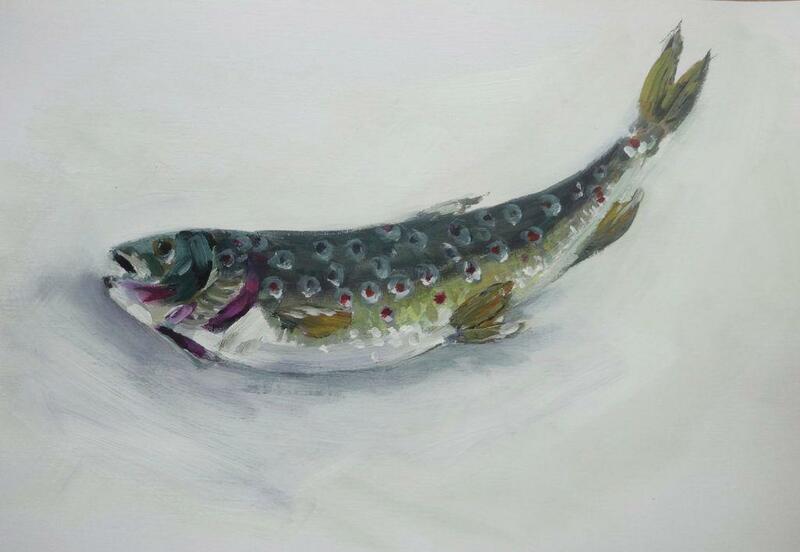 Trout! 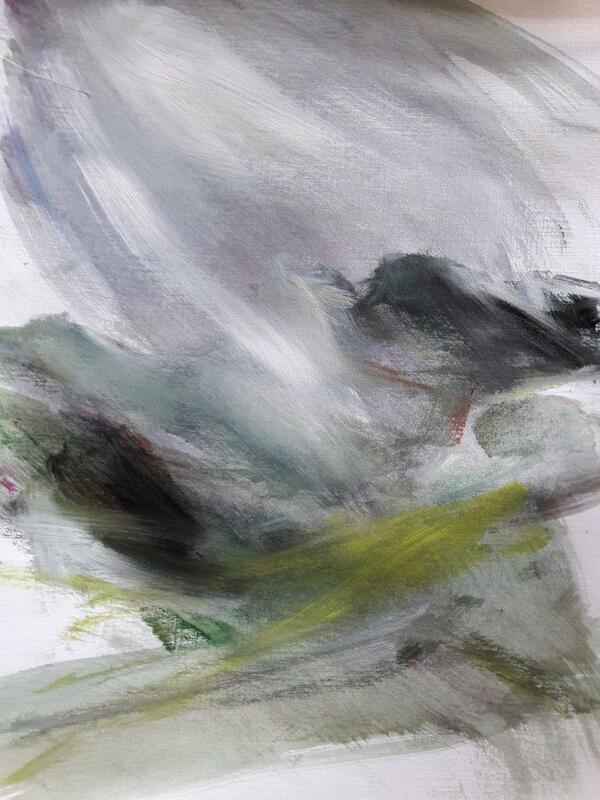 Study in acrylic on paper. 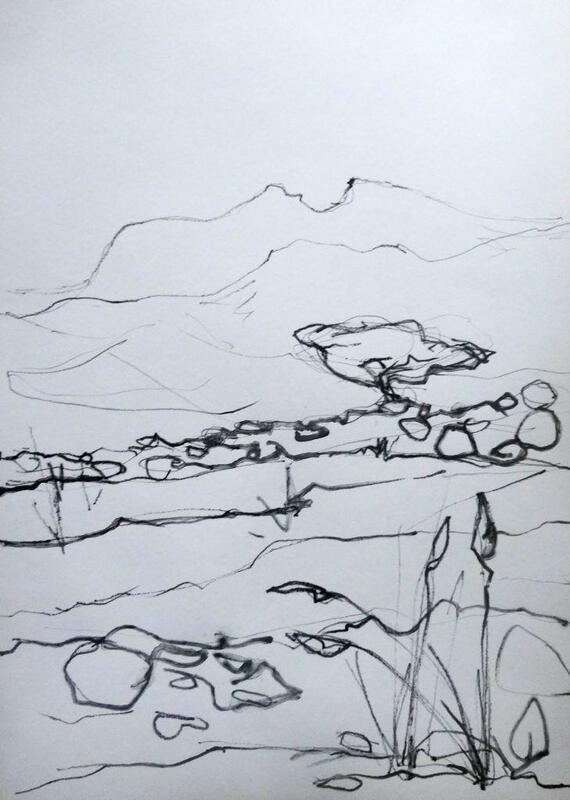 Line study of the view from our bedroom window. 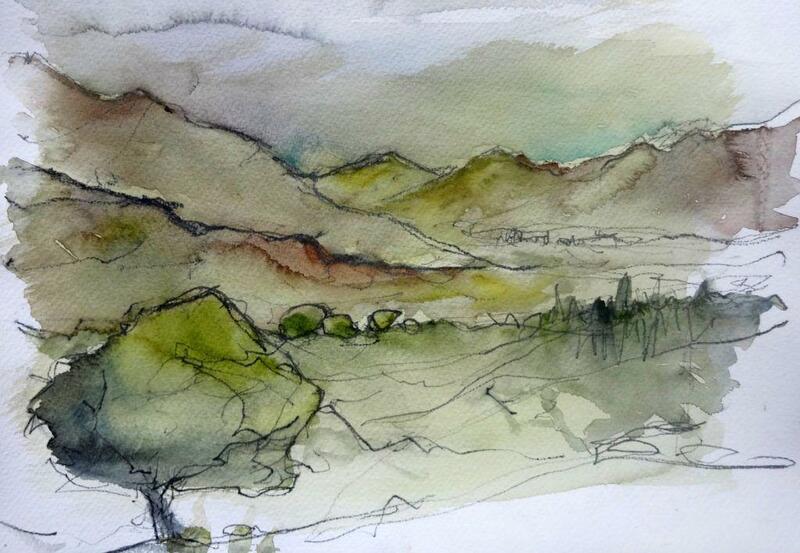 You may recognise the distinctive ‘bite’ out of the summit from some previous paintings. 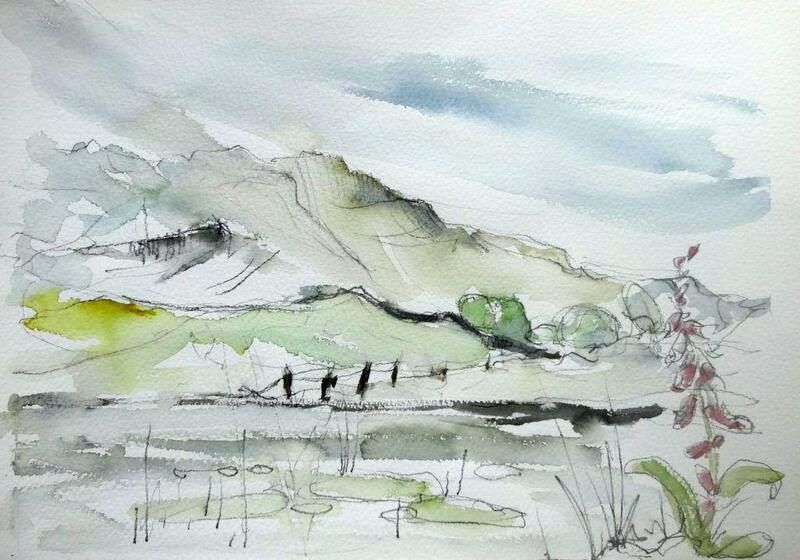 Just down the track from the house, there are wonderful views towards Llan Ffestiniog. …and again from a slightly different angle and in different weather. Hot weather haze. Colour study. 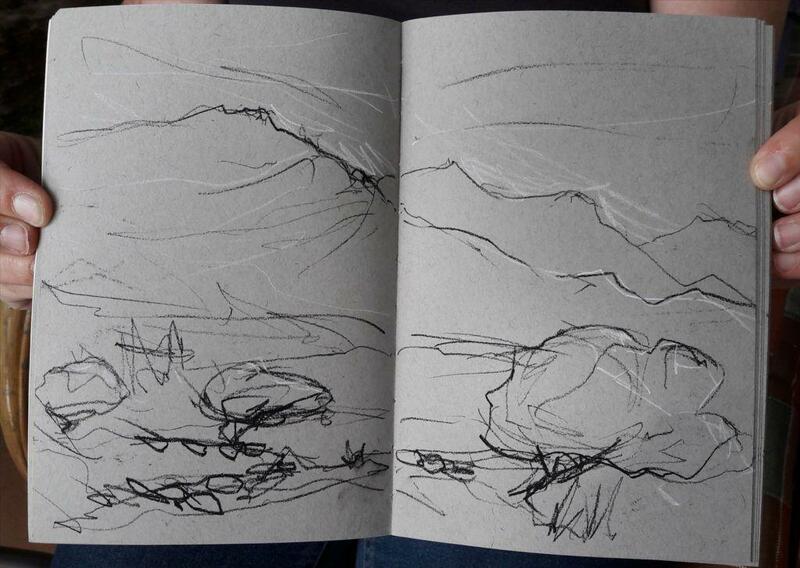 I carry a little sketch book me wherever I go – I never know when I’ll need it! 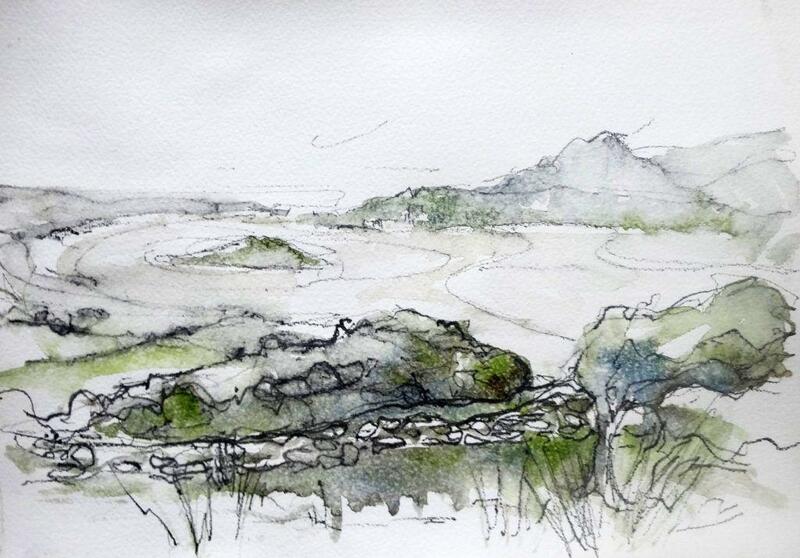 Love the grey paper in this little beaut (thanks Lynne!). 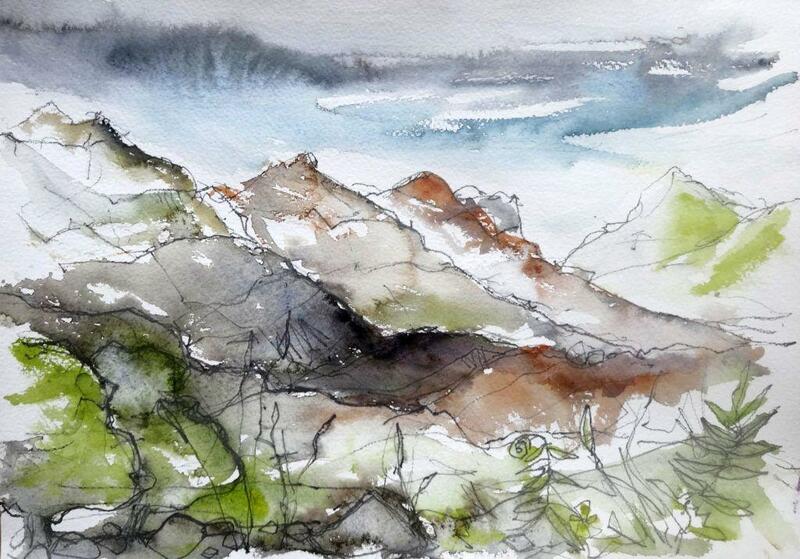 A storm breaks over our mountains with high winds and rain lashing the hills and obscuring the summits. I’m going to need a bigger board! 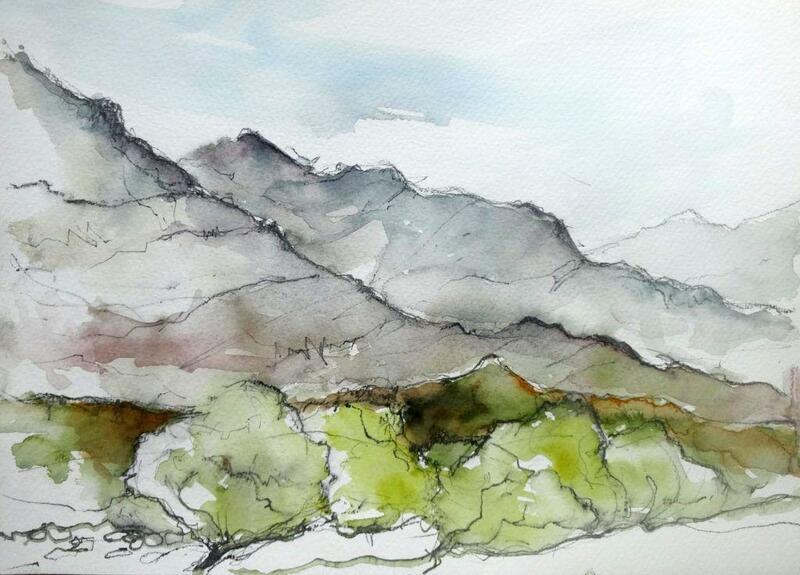 This is a sketch for a commission of Cadir Idris range from Tal y Llyn. 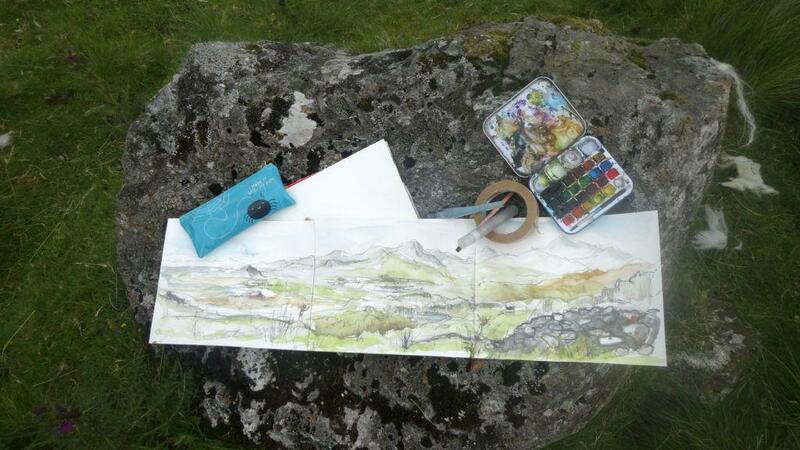 Worked over three pieces of paper as the view demanded a wider aspect. 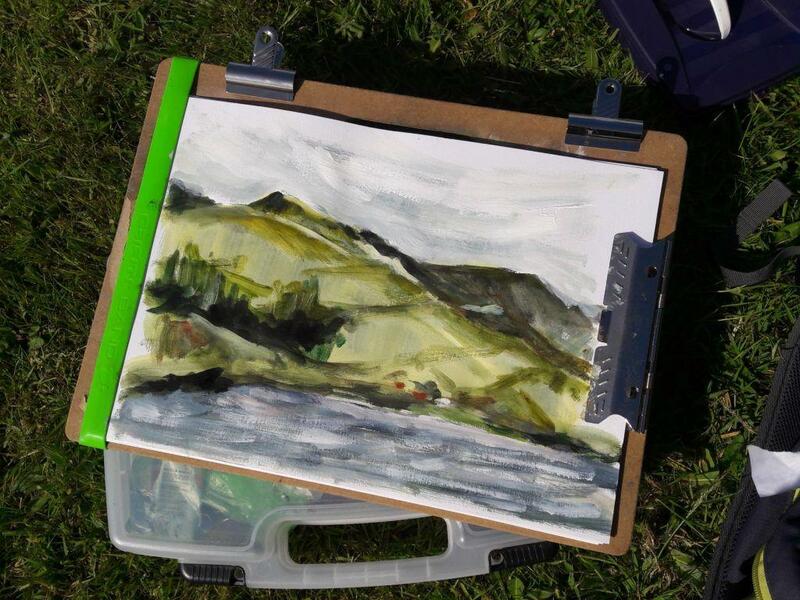 Colour study of the Cadir hills rising from the lake (acrylic on paper). I returned to this view on a day that turned on me and soaked me! 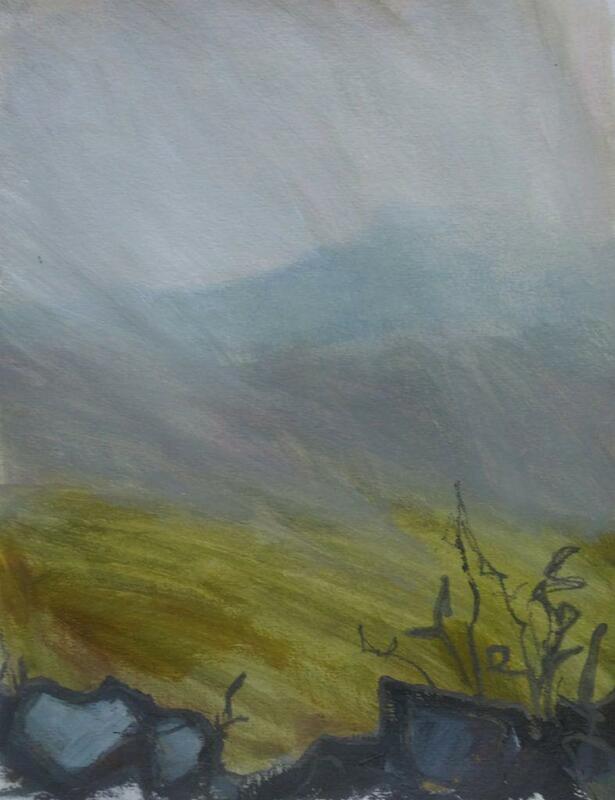 I actually think this sketch I did in acrylic and graphite on unintentionally wet paper is one of my best in terms of capturing the atmosphere and a sense of the thick mizzle and mists. Welsh weather! The house is high up in the hills, so can sit in the clouds. 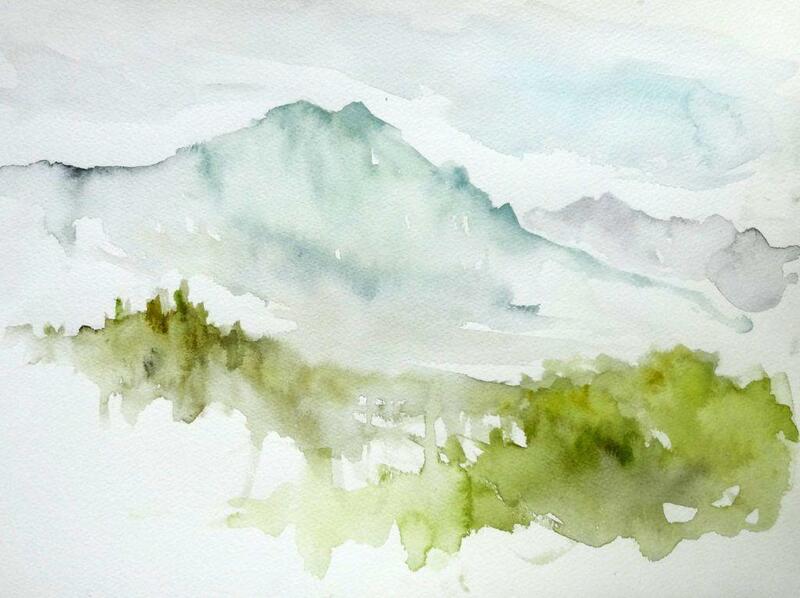 Mist and mizzle softens everything and turns the hills soft hues of blue, lilac and gold. 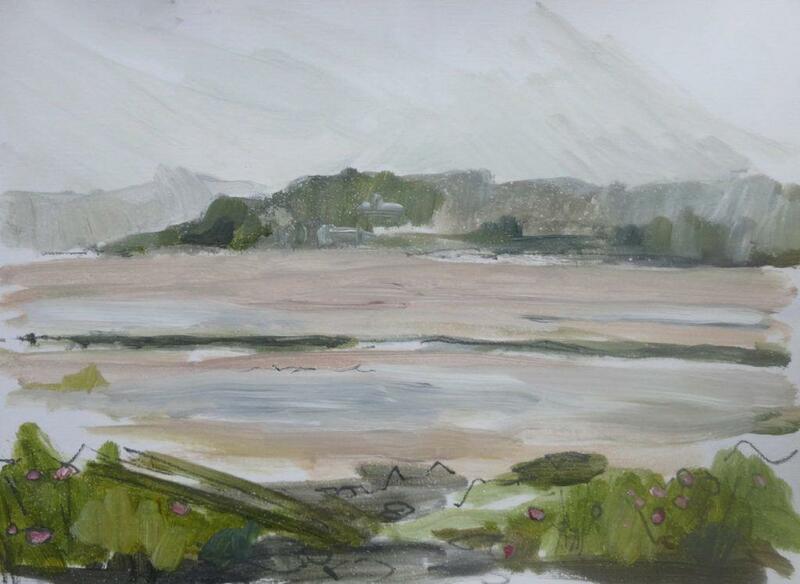 Acrylic on paper. 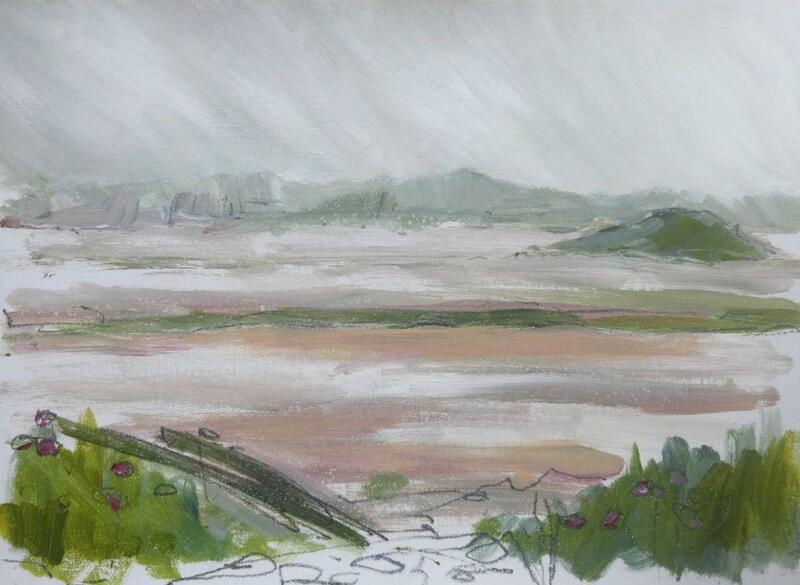 Misty and rainy view over estuary towards Portmeirion with sea thrift on the rocky shores in the foreground. All I could hear were skylarks. 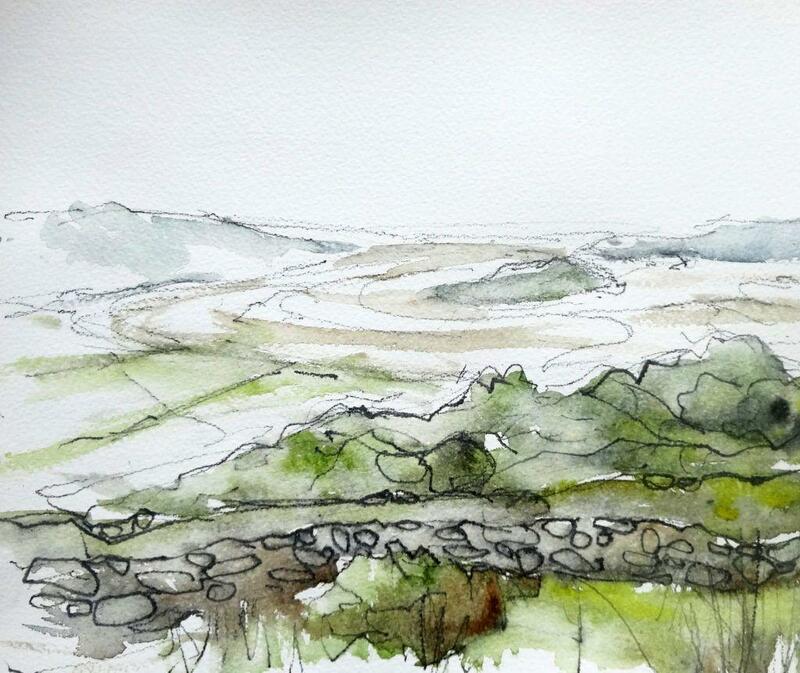 …and with Ynys Gifftan in view. The mists have come down a bit more for this one. One of my favourite beaches just below Harlech. 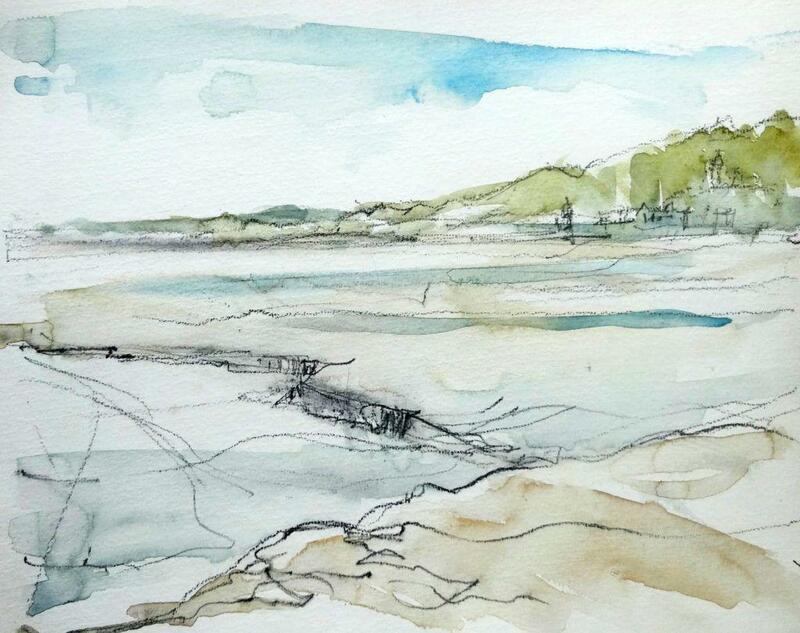 It has everything – soft sand, dramatic rocks and rockpools, the most amazing views towards Harlech and the Llyn Peninsula and a fantastic ice cream shop! The sun was out again for this one. 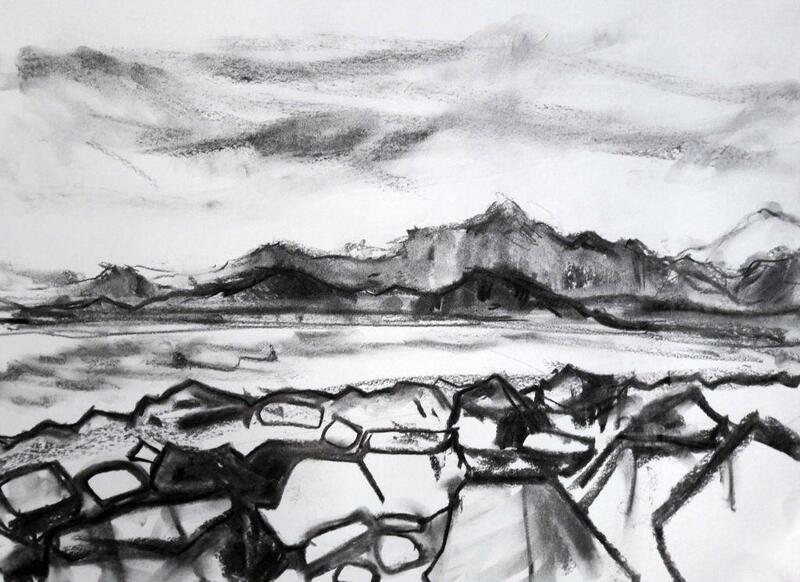 Charcoal study of the same view. 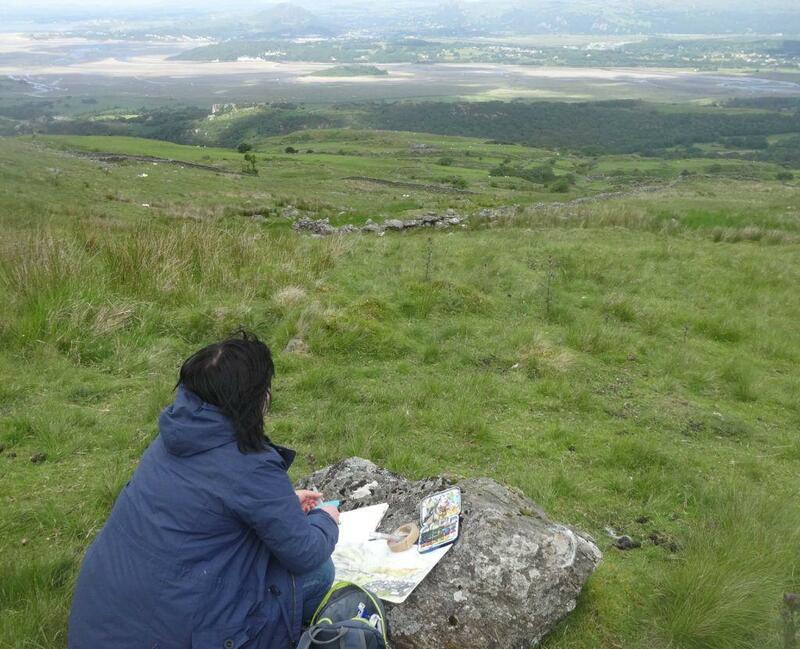 On the final day, we walked up, up and up some more to get a spectacular view over the estuary and the Snowdon range. Absolutely stunning and worth the pain! 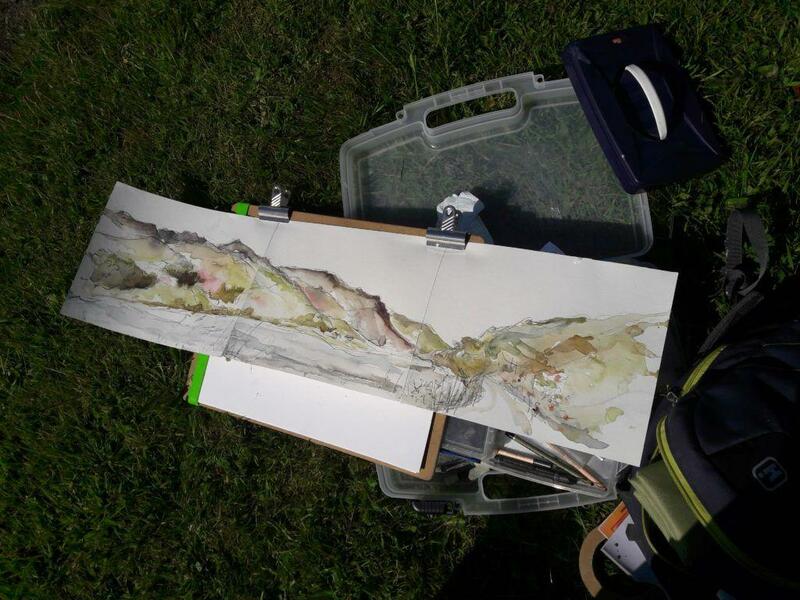 I ended up using a well-placed boulder as an easel and anchored the paper down with anything I could as it was very windy up there!